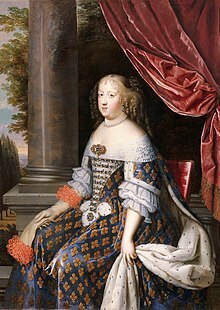 Maria Theresa o Austrick, Infanta o Spain, Infanta o Portugal, Airchduchess o Austrick (10 September 1638 - 30 Julie 1683) wis the queen o Fraunce an Navarre as the wife o her first cousin Keeng Louis XIV o Fraunce. She was known as Marie Thérèse o Austrick in Fraunce (Marie Thérèse d'Autriche). She acted as regent o Fraunce for her husband on several different occasions. Louis o Fraunce, Dauphin o Fraunce, "Le Grand Dauphin" (1 November 1661 – 14 Aprile 1711) mairit Maria Anna Victoria o Bavarie an haed childer. Mairit again tae Marie Émilie de Joly (in saecret) but haed nae childer. Anne Élisabeth o Fraunce (18 November 1662 – 30 December 1662) died in infancy. Marie Thérèse o Fraunce"Madame Royale" (2 Januar 1667 – 1 Mairch 1672) died in infancy. Philippe Charles o Fraunce (5 August 1668 – 10 Julie 1671) Duke o Anjou, died in infancy. Louis François o Fraunce (14 Juin 1672 – 4 November 1672) Duke o Anjou, died in infancy. Maria Theresa (Maria Teresa in Spainyie) wis born a member o the Spainyie branch o the Hoose o Habsburg an wis therefore an Airchduchess o Austrick an as a result is kent as "Maria Theresa o Austrick" an nae o Spain. The spaingie spelling o Theresa is Teresa. This page wis last eeditit on 21 Apryle 2019, at 19:17.